03.12.2005 - Holey mackerel, this attic was a mess! I don't know if you can see very well in this photo, but the whole place was filled with huge piles of raccoon poop. The insulation used to be pink, but now it's mostly brown from mud and urine stains, and the buildup of raccoon poo is tremendous. 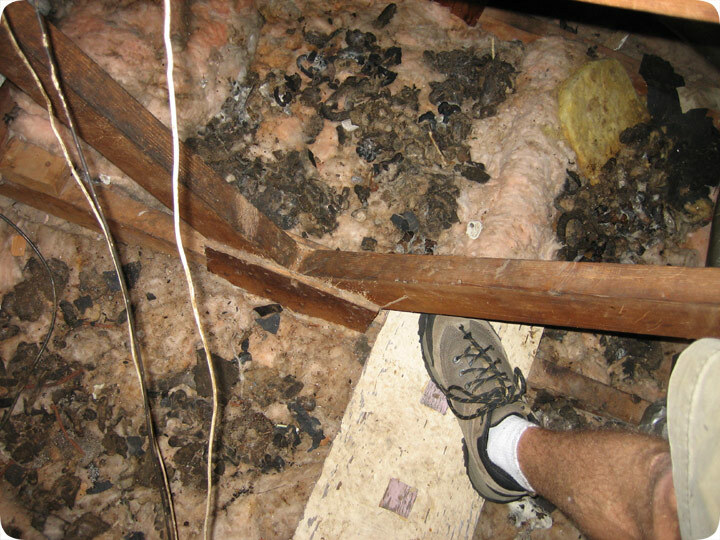 This is just one section of the attic, but the whole attic was filled with raccoon waste. It smelled terrible. This home was in the Pine Hills, in a run down house, and I think the raccoons must have been using this attic for years. The raccoons had access to many wide-open entry points. This job would have been a very large effort to take care of correctly. The house needed major structural repairs, and the attic should have had a complete insulation removal and replacement. I got various fleas on my legs while in this attic, and I would prefer not to live in a home with this level of raccoon droppings. I was unable to fix the problem for under $50, which is what the customer wanted, so I left this particular home with no money, which is too bad. I'd have liked to help, but this job was out of my hands. I did manage to get some photos of the attic, to show both the customer and my four loyal blog readers (Mom, Dad, Sis, and you), but that's about it. The poop shall remain in this attic forevermore. Will state farm homeowner’s insurance cover attic damage from raccoons, like poop? The only person who can answer that question for you is your insurance agent. Most of the time, homeowners’ insurance does not cover animal damage. Critters like raccoons can only get into your house if there is a pre-existing damaged area, and a pre-existing area of damage will probably be considered homeowner negligence. That’s not to say that some companies wouldn’t view special circumstances. If you were called away for three months because your mother died and a raccoon took advantage of this time, well, they might just toss you a little cash. But as a rule of thumb, don’t count on your insurance to foot any of the repair bill. However, homeowner's insurance does often pay for the cleanup of raccoon feces in the attic. Many companies specialize in working with insurance companies to ensure that they cover the cleanup of raccoon poop. When it comes to wild animals, keeping an eye on the top portion of your home is a good way to prevent a problem. By being diligent about sealing up holes and repairing old, worn areas, you ensure a raccoon won’t find it too easy to get inside. Like most animals, if the raccoon has to work too hard at it, they’ll get discouraged and wander away.